My name is A. Marko Tsourkan. I live in Mt. Vernon, NY and I work from my workshop in New Rochelle, NY. As long as can remember, I have always been into knives. A vivid memory from my childhood - my grandfather peeling an apple with his small patinaed carbon folder and me thinking: I want that knife! I got my first folder at the age of 8 and I remember being infinitely happy about it. I carried it in my pocket with me all the time and while that knife is long gone, a reminder of it, a deep scar on my left index finger is ever-present. Helping around the kitchen was part my household chores and that's where I learned to enjoy cooking. For a long time, German kitchen knives were the best tools I could wish for myself. I have owned knives from Henchkel, Wusthoff, Fissler, WMF. Then about 11 years ago, I started hearing about Japanese knives and how they were a step up from German knives. I came to one of the forums in search for information abouit Hattory HD santoku (!!) and never really left. I started with factory Japanese knives from Hattori, Misono, and gradually eased into handmade knives from Watanabe, Shigefusa and the like. Back in the day there were only a handful of people making custom handles, and sayas. In fact I can only remember one – Steffan Keller, as another member – Fish, was MIA. Unfortunately, later it turned out that he passed away. I had a little bit of woodworking skills and a lot of desire to learn, so I started with sayas and handles. The learning curve was moderately steep, but I became reasonably proficient in both, so that people started commission custom work from me. About the same time, roughly ten years ago, I met Devin Thomas on the forum. Devin graciously invited me and Mario Ingoglia to visit him in Panaca, Nevada for a free knife-making workshop. 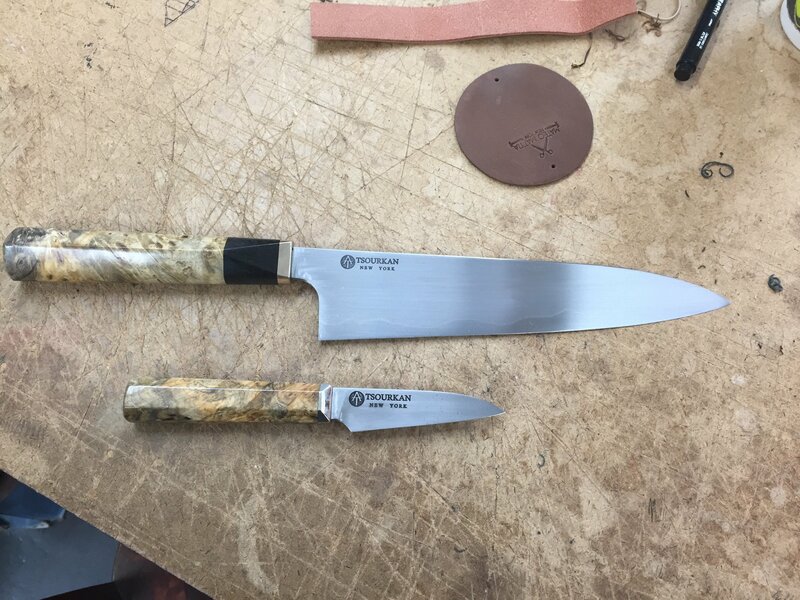 He showed us how to make a knife from start to finish. And that is how I got into knife making. We have been friends with Devin ever since. He helped me tremendously on my journey and I am very grateful. In design, I like simple, elegant forms, and Japanese knives naturally fit in, so profiles and geometry of my knives closely follow those of Japanese. Investing in tools is only a good investment as long as they are high quality and last a long time. That’s what I aim for my work. 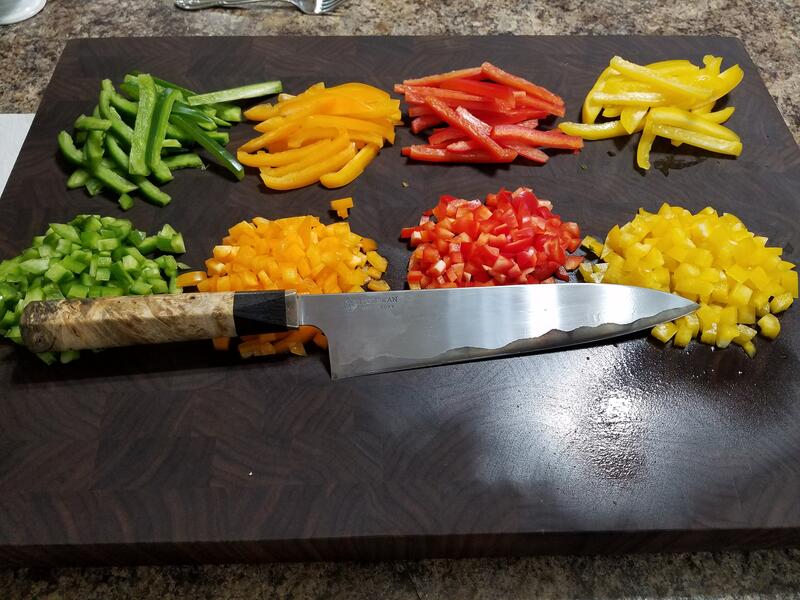 I select steels that are best suited for kitchen knives, I go through rigorous testing and feedback before I settle on a heat treatment, grind, handle design, etc. 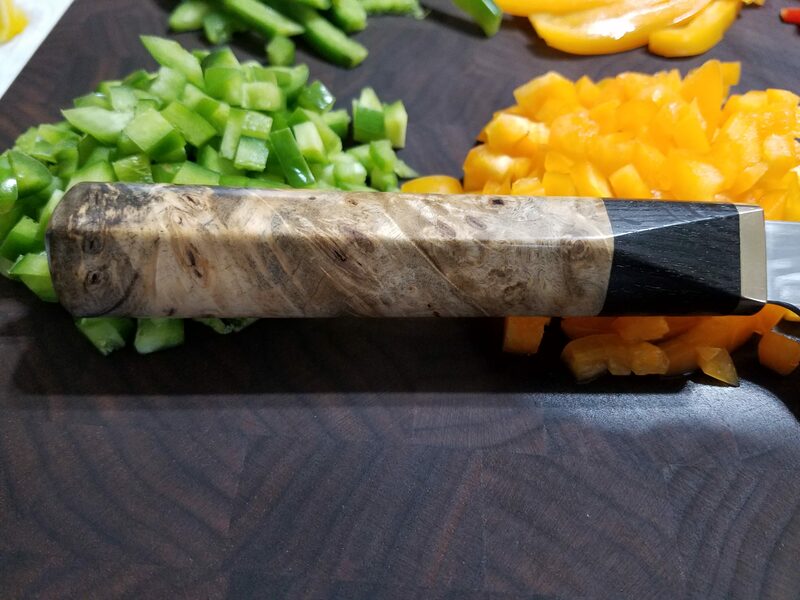 I think with proper care, the knives I make will last a life-time for an average user. Lastly, I strongly believe in sustainability and responsible use of resources. I am phasing out tropical hardwoods past what I already have, as unfortunately it is not longer possible to confirm that any woods from African and South American countries are logged responsibly. I also would not touch elephant ivory, even pre-ban, out of principle. As far as I am concerned, that’s blood money, and I want no part of it. Can't wait to see what you have coming! Words can't even describe how happy I have been with your work! These are definitely "keepers" in my collection. Don and Marko...that gyuto is stunning! Everything about it is pure art. It is steel similar to White #1. I got it from Devin Thomas. He calls it "Spicy White". It's a pleasure to make contact with you. I've wanted to for some time. The crazy thing is I live only about 8 or so miles from your workshop (directly across the sound alas...). I own one of your 250 A2 gyutos as well as a practice 180 paring knife. I love them both. A question for you if you don't mind? I believe I read somewhere you recommended diamond plates to sharpen your A2? If I may, why is that? I'm delighted to see you working with CKTG. Using and owning your two knives is a true joy for me. That’s a great looking gyuto Don. Nice pictures too! A2 is a tool steel and vanadium in it makes it a little more difficult to sharper to razor sharp state on water stones. Over the years I have refined over the years heat treatment for A2, closing the gab in sharpen-ability between it and carbon steels, but I find that it is still best to finished A2 on diamond, be it 8K DMT Diasharp plate, or even 1M diamond spray on felt/leather strop. Thank you Marko. This makes sense to me now. I'd gotten nice results using Nubatama Platinum but once I started loading my stones with CBN sharpening and loading my strops I found the edge on my knife really sang to me. Hi Marko, I am sorry I missed introducing myself in Chicago. Welcome to the forum, your work is beautiful. Devin has been a big help to me too , he always answers every question! Hi Marko, just wondering how I can reach you to discuss a custom handle. Love your work, wish I had the money for a knife. Thanks. I have a chance to purchase a Tsourkan gyuto made with 52100 honjaki steel. Some have said a honyaki blade is more difficult to sharpen. What is your opinion? 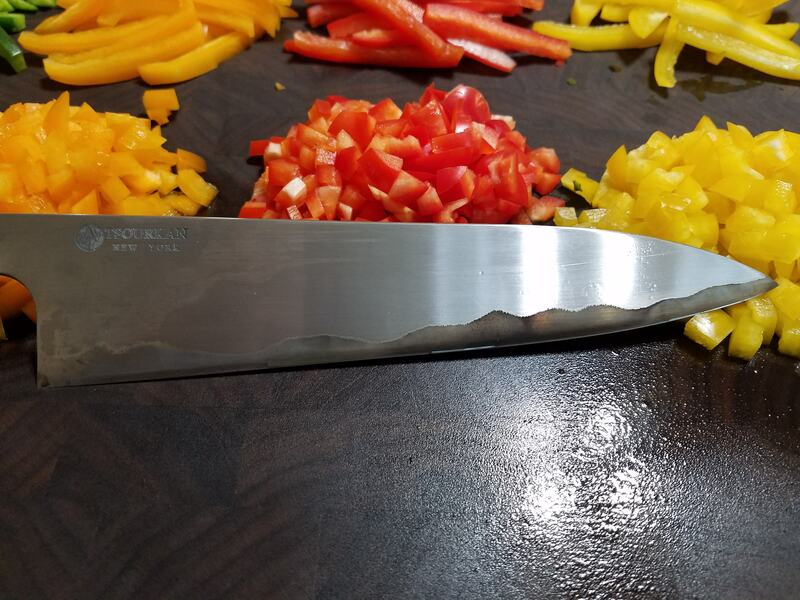 What Rockwell hardness do you temper your honyaki 52100 to?